The development of large Track & Trace projects entails a close cooperation between the supplier and the clients throughout all of the project’s development stages. To meet these requirements, Antares Vision has created the ATS Task Force, made up of managers and engineers with multidisciplinary experience, spanning from ERP, to production and warehousing, to product inspection. With the experience of more than 300 serialization and aggregation lines fully operational, this team of professionals is able to support the customer from early analysis and system design, to commissioning and validation, up to the long term maintenance of the Track & Trace system. A strong top-down approach to IT infrastructure, data management and security, coupled with machines and devices expressly designed and tailored for each production line is the base concept of ATS. At shopfloor level, ATS software modules are based on real-time hardware platforms to ensure perfect data synchronization even on the highest production machines such as latest generation case packers. Handheld readers and HMI placed along the lines allow following production progress and managing the exceptions such as damaged cartons or labels, partially-filled bundles, changes of hierarchy. Each station is independent from the other thanks to the inbound and outbound controls: the redundancy in control allows for absolute reliability even if the packages are removed or damaged in the conveying zones between two successive stations. A complete family of stations for serialization is available. These modules – beside printing and verifying the datamatrix and variable data, can integrate labeling modules for the “French vignette” and the “Italian Bollino”, and optionally include a checkweigher and tamper evident seal application, thus allowing a great saving of space on the line. 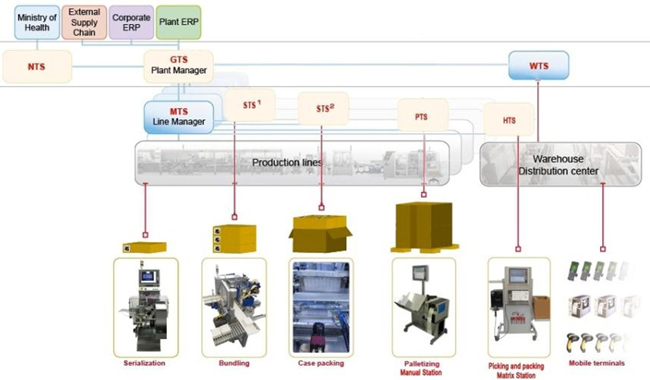 To build the parent-child relationship (aggregation) in the most reliable way, a number of specific devices can be placed along the packaging lines: labelers, special cameras to read printed codes into bundles, cases, reject stations, as well as standalone printers and handheld readers. 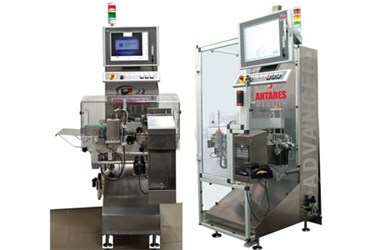 Antares Vision is able to integrate all the different devices in one unique interface that the operator can easily access from any of the touch screens placed on the line. The complete and efficient solution for bottle traceability and e-pedigree. An inspection and association stand-alone module prints a dummy-code on the bottom of the bottle and associates it with the recognized 2D code on the bottle label. This association, made by a dedicated software, facilitates aggregation requirements at the bundle and/or case level. Once programmed, every format is centrally stored on the Database and is automatically downloaded to each device at every format changeover, avoiding additional workload to the operator, minimizing setup time and, more importantly, avoiding any possible mistakes.